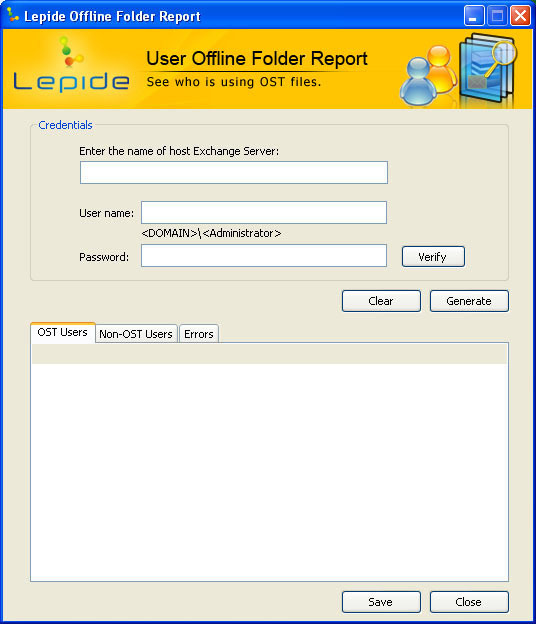 Free Lepide Offline Folder Report tool is an effective network management solution to generate instant reports showing OST and non OST users. Free Lepide Offline Folder Report tool provides the administrator with the easiest way to determine which mailboxes process their email data in OST file. OST file reports generated using free Lepide Offline folder report tool contain three fields i.e. OST users, non OST users. ...... Further these reports can also be saved to the desired location. OST file reports generated using Free Lepide Offline Folder Report can be saved in CSV format, which is easily accessible with MS Excel. This network management and offline folder report tool is absolutely free of cost and can be used without any restriction. For using this tool admin credentials are used therefore, the user must have admin rights for generating offline folder reports with free Lepide Offline Folder Report. Click on Generate button to generate the report of OST users, Non-OST users and error list. Qweas is providing links to Free Lepide Offline Folder Report 10.12.01 as a courtesy, and makes no representations regarding Free Lepide Offline Folder Report or any other applications or any information related thereto. Any questions, complaints or claims regarding this application Free Lepide Offline Folder Report 10.12.01 must be directed to the appropriate software vendor. You may click the publisher link of Free Lepide Offline Folder Report on the top of this page to get more details about the vendor.